Sarah LaFave, right, and Natalie Sabadish of Lori's Hands assist John with holiday decorations. Lori's Hands volunteers Alex Cangero, Shante Johnson, Catie Muellenberg and Kristen Cousino help sort through the decorations. 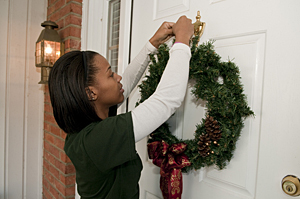 Shante Johnson hangs a Christmas wreath. The Christmas tree fully decorated, John celebrates with Lori's Hands volunteers, from left, front row, Kristen Cousino, Natalie Sabadish, Alex Cangero, Shante Johnson, and, back row, Sarah LaFave, Chris Murphy, Liz Bonomo, Jacques Freeman, Brendan Scarano, Bernice Man and Catie Muellenberg. 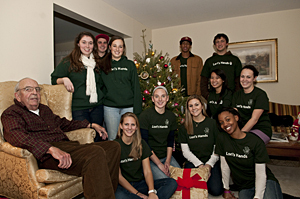 8:21 a.m., Dec. 16, 2010----Lori's Hands, a registered student organization at the University of Delaware, received national recognition on Dec. 16, when USA Today featured the group's founder in its Holiday Heroes series. Sarah LaFave, a senior nursing major in the Honors Program at UD, started the organization in 2009 in memory of her mother, Lori, who died of breast cancer in 2003. Lori's Hands volunteers help elderly and chronically ill people in the Newark, Del., community with household chores like shopping, laundry, yard work, and pet care. The group dedicated their time on UD's Reading Day, a day off between classes and finals, to helping decorate their clients' homes. They also delivered 13 personalized stockings to clients and remembered their pets with treats and toys as well. The first stop on the group's afternoon schedule was the home of John, a 1950 graduate of UD who has lived alone since his wife died of breast cancer two years ago. Lori's Hands members have been helping him with housecleaning every two weeks for the past several months. On decorating day, four volunteers helped John carry stacks of worn cardboard boxes, filled with vintage Christmas ornaments and labeled in his wife's handwriting, down from his attic. The young women sorted eagerly through the tissue-paper-wrapped treasures while they waited for other volunteers to bring a fresh-cut Christmas tree. After the tree arrived and was bolted into its stand with the help of three fraternity brothers from the UD chapter of Phi Gamma Delta, the students made short work of adorning it with lights, ornaments, and tinsel. They also arranged holiday figurines on the living room tables, strung lights along the porch roof, and turned a pillow into a package with a red velvet ribbon. They even remembered to put the empty boxes back in the attic and vacuum the pine needles from the carpet. One of those moments at John's house was sharing memories of lost loved ones. Although he and LaFave are separated in age by more than six decades, both remember people who “lit up a room” when they walked in. In addition to the time invested by the Lori's Hands volunteers, the College of Health Sciences “adopted” the project for the season, collecting $500 in cash as well as dozens of items from a wish list compiled by the students. Some of the money was used to buy timers and extension cords for the organization to use year after year. Home Depot also donated a number of items, including trees and lights. For more information about Lori's Hands, send email to [contact@lorishands.org] or call Sarah at (518) 256-0298.